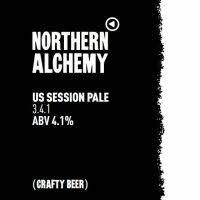 Northern Alchemy is a microbrewery working out of a converted 30 foot shipping container, lovingly known as The Lab, sited just behind The Cumberland Arms in The Ouseburn area of Newcastle upon Tyne. We focus on flavour led beers that are sold in keykegs, bottles (330ml) and occassionaly cask. Run by two brothers-in-law Andy Aitchison and Carl Kennedy we aim to explore what flavours can lend themselves to different beer styles. Exploring everything that beer can be is our modus operandi. From the variations available in the malt profile to the incredible choices in hops from all around the world. And then there are the flavours (adjuncts) that can be added. All Northern Alchemy beers are entirely natural products. Unfined (no ‘finings’ made from fish swim bladders and therefore suitable for vegans) & unfiltered. This means all of the flavours deliberately chosen for the beers are exactly what the customer should taste. Most of our beers will have a natural haze to them because we don’t subject our beers to these extra processes, in our opinion it’s how beer should be. Times are exciting for the UK beer scene. When you add the type of beers that breweries like us are making to the excellent beers already produced by fantastic breweries. Things are very exciting. There’s a move away from more mass produced and, at times, tasteless drinks that have been so prevalent in the drinking culture in the UK. People want quality in their drinks just like the quality that has been evident in the change of food over the last 30 years. You could go to a bar and get a whisky, the usual bog standard stuff that all bars sell. And you’ll get a cheap drink, brilliant, if you’re happy, crack on. But there are gonna be people that’d rather spend more on a special single malt or what-have-you. Produced with much more expensive ingredients and hand crafted by someone who loves what they do. That’s the difference. Both are valid and neither should judge the other. Horses for courses. Live and let live!